When designing your new bathroom, your first decision will be the overall style and feel. Do you want a space that’s casual and relaxed, or are you drawn to something more elegant and luxurious? When you want a modern bathroom that feels sophisticated with a timeless look, Nuevo White Carrara tile may be the perfect choice. Here are a few ways that you can go beyond the white floor to create a stunning bathroom that’s sure to make an impression on family and friends alike. You may be wondering if it’s possible to have too much of a good thing, and the answer is yes. While some people would love to have an ocean of white in the bathroom, you may worry that it will be overwhelming and even blinding. However, you don’t have to surrender your dream of a modern, luxurious retreat that effectively uses white tiles. Cover the floors in a soft wood with a light finish, but then put magnificent white marble behind your pedestal sink, on the wall next to your commode, and in the shower. The marble will give the space a clean, fresh look without feeling overwhelming. If you cannot find the perfect cabinet at your local store, then consider customizing something using marble. A current growing trend is the use of shelves rather than cabinets. You can order larger slabs of marble to create a long counter with a shelf beneath. Rather than traditional bowl sinks that fit into the countertop, go with a round or even square basin sink that will sit neatly atop your marble. Vessel sinks are the perfect choice for any modern bathroom, and they’ll look stunning when paired with a marble surface. You can either use the marble cabinet alone or pair it with marble walls and floor for a more powerful impression. Never underestimate the power of stainless steel or chrome accents. Brightly polished metal accents can break up white finish and add an interesting look to the bathroom. This is a great way to finish off a bathroom where the floor and walls have been done in white marble tiles. Use matching chrome accents in your hardware such as drawer pulls and towel bars to maintain the modern feel and luxurious look. You may want to drop to softer lighting in the room so that it will feel more welcoming. Otherwise, the light reflecting off your metal and polished tiles may prove to be too bright. In addition to using metal accents, you can also introduce a metallic color on the walls. Choose a sharp silver color and then give it a textured finish that will look amazing with the smooth marble tiles. Finish off the space with soft gray or glass accents. The resulting look is modern, sophisticated and impressive. White Nuevo Carrara marble looks impressive with any other color, so it’s easy to add a brilliant hue to your bathroom. Use white tiles on the floor and then put luxurious blue mosaics in the shower to make the space more interesting. If you want a more interesting look, then reverse the trend and put the deeper colors on the floor with pure white marble in the shower or on the walls. The contrasting colors will make your bathroom more casual without losing the luxurious, modern feeling. Black and white is a timeless combination that’s elegant in any setting. If you want a more refined look, then use the black granite as a border in the floor or to top off a lower wall covered in white marble tiles. You can also highlight the counter area by using a row of black granite as a backslash while framing out the mirror in White Nuevo Carrara marble. There are countless patterns that you can create, and each can be as interesting and appealing as the next. Another smart option is to soften the white tiles with the addition of elegant travertine tiles. Travertine is an excellent choice for the flooring, and you can then make the bathtub surround stand out more with impressive white marble. The combination of warm and cool colors will give your space a luxurious feel while drawing more attention to the beautiful colors in your Nuevo White Carrara tiles. You aren’t limited to using marble in the floors and around the tub apron. You can also install marble as the threshold to the room, use it to build up the threshold around a zero-entrance shower, and install it in the windowsills. Adding marble to these unexpected areas will give your room a fresh look and help make it more visually appealing. Marble is attractive and easy to care for. You can use this timeless building material to make your bathroom more luxurious and sophisticated. 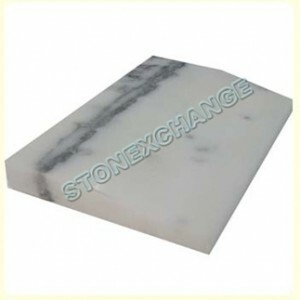 It’s natural to have concerns over the cost of marble, but there is a very easy way to save on this valuable product. Rather than going to the local home improvement store, work with a wholesaler who offers quality stones at amazing prices. Stonexchange has a distribution center in Miami, and we quarry and manufacture all of our own stones overseas. We’re able to implement superior cost and quality control measures throughout the supply chain, and you benefit from this through lower rates and superior tiles. We take great care with shipments to minimize the risk of damage. You’ll enjoy a more attractive purchase price, and you’ll save time culling out damaged tiles when the shipment arrives. Your luxurious new bathroom is closer than you think. Contact Stonexchange today to learn more about our inventory and place your order.